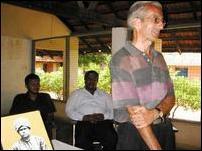 Dr.Gerard Robuchon, a French citizen spoke in fluent Tamil to students of the school and handed over prizes to the winners of the school essay competition on the late Tamil scholar Mr.Kanagasuntharampillai. Mr. Kanagasundarampillai played a valuable role in publishing the Tamil Lexicon on behalf of the Madras government as the senior assistant editor of the publication. President of Trincomalee Muthamil Valarkalai Mantram Mr.C.Sivapalan gave away the prize to the student who came first in the essay competition. 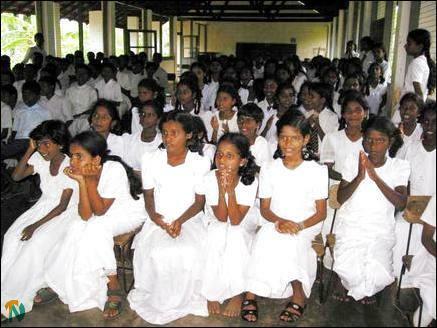 Trincomalee Muthamil Valar Kalai Mantram declared August 2003- August 2004 as the year of late Mr.Kanagasuntharampillai whose 140th birthday was celebrated two months ago. Mr. Sithy Amarasingham, head of the Eelathucholai Publishing house in Trincomalee said essay competitions instill in the minds of younger generation the services rendered by late Mr. Kanagasundarampillai to the development of Tamil language. The first competition in this series was held in Sambaltivu Tamil Maha Vidiyalayam and in other schools would follow in coming months, said Mr. Amarasingham. Mr. Kanagasundarampillai was born on 24th August 1863 in Trincomalee. At the age of seventeen he left to South India and became a graduate in English language. He joined Madras, Saitahpettai English Teachers’ Training College as a lecturer. At the same time he served as a Tamil teacher at Madras Christian College and Pachchaiappan College. He was the author of several books. As he had mastered Sanskrit he translated the chapters of Kishkintha Kandam and Sunthara Kandam of Valmiki Ramayanam into Tamil. He paraphrased several Sangam literatures and brought several ancient Tamil literatures found in Ola form in print, Tamil sources said. Mr. Kanagasundarampillai died in 1922.